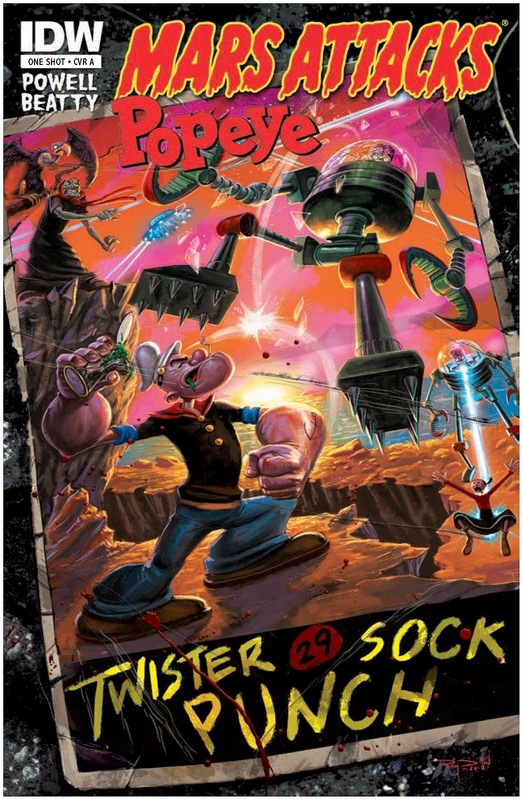 The Fellowship was fortunate enough to obtain a copy of MARS ATTACKS POPEYE from IDW Comics. The story is by Martin Powell with art, colors, and lettering by Terry Beatty. It is a dark and stormy night as the Martians land on Earth only to become hypnotized slaves to the Sea Hag. The next morning, Popeye and Castor Oyl (who have been away on a trip) return to find Sweethaven destroyed. The two eventually find the others thanks to the assistance of Eugene the Jeep. Professor Wotasnozzle informs our heroes of what has been going on (and what a Martian is) and figures the best way to defeat them is to have a weapon of their own. Jeep appears on one of the flying saucers to grab a ray gun. While the Professor heads off on his task, Popeye sets off to form an army to handle the threat. While Pappy refuses, Alice and the other goons join Popeye’s cause. Will it be enough to take on what the Sea Hag and the Martians have, or is it all in vain? Also, will there be a Spinach sighting (c’mon, it’s a Popeye comic)? This comic was a fun, enjoyable read with a nice touch of humor thrown in. I wasn’t sure how this crossover would work, but it was better than I hoped. It even looked natural to see Popeye in the same panel with the Martians! Hopefully the rest of the MARS ATTACKS crossovers is as good as this one. MARS ATTACKS POPEYE is in stores now and available at www.idwpublishing.com.